This sixth collection from Gerber, with seven novels (Anna in the Afterlife, 2002, etc.) 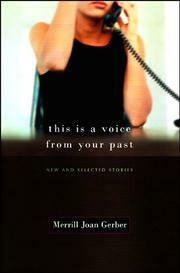 and four books of memoir to her credit, offers a baker’s dozen about women in peril, love, and grief. In the title story, a woman at first welcomes getting a call from a former writing program classmate—until he turns out to be on the skids: the piece builds in suspense, ending with the narrator looking over her shoulder, not answering her phone, fearful of this wreck of a man. “I Don’t Believe This” continues a theme of terror at what a man might do—in this case detailing graphically the danger posed by a rejected husband whose wife has gone with their sons to a shelter for battered women. “Tell Me Your Secret” deals once again with a young woman in a writing program, this time preparing for an illicit overnight at a professor’s party. News of her grandmother’s death forces her to look at every choice she makes in a new light. As a once formidable mother-in-law, mellowed with age, pleads with her daughter-in-law to visit more often, the younger woman realizes (“Latitude”) that power in the relationship has shifted to her, while a confident young wife is undone by the sight of her uncle’s body at his funeral (“We Know That Your Hearts Are Heavy”), and “A Daughter of My Own” captures the tension when a mother comes, unbidden, to “help out” with a firstborn baby. Less successful is “My Suicides,” a sketchy piece that reprises the suicide of the abusive husband from “I Don’t Believe This” and ends with a “Survivors-of-Suicide” meeting. “Dogs Bark,” finally, is a nightmarish and ominous tale of how the troubles between neighbors can erupt into violence. Gerber writes powerfully about the twists of family life in stories crisply told: heartfelt dispatches from our ambiguous time.